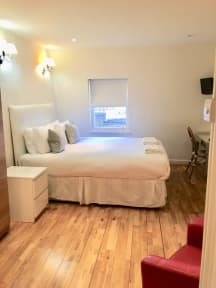 With our own private back garden, which includes outdoor seating area, we are a great choice for travellers who want a charming and peaceful place to stay.There are several shops, grocery stores, bars and restaurants, as well as live music venues nearby. Breakfast is not provided, however, are several supermarkets and cafes, (plus bars and restaurants) within a five-minute walk. Food / beverages can be stored in our communal fridge. The hotel is just a 5-minute walk from Earls Court Tube Station, Kensington Palace is less than a mile away, whilst the Natural History Museum, the V&A, Science Museum and Hyde Park are within 15 minutes' walk. Guests may leave luggage in the communal reception. This is an unsupervised and unsecured area. Location was amazing! Very very tiny room. Very clean though and beds were really comfortable. Kettle in one of our rooms didn't work but there was another downstairs so that was fine. Loved the access to free coffee/tea. Shower had good pressure but a weird nozzle that sort of just plonked the water on you. There is access to a communal fridge, but it's essentially a mini bar and you can't store meat or alcohol in it. Communal courtyard was really cute, staff were very friendly. The room was small with a double bed - nice and bright - clean bedding and towels provided. A kettle, iron, ironing board and hairdryer provided. Tea, coffee, biscuits etc provided. Small ensuite with toilet, sink and shower. Everything you need. Very little traffic noise from outside - nice and peaceful. Close to plenty of nice restaurants, shops, pubs, etc, and Earls Court underground station was only a few minutes walk. The location is ideal. For the price, this place can't be beat! With a late check in time of 2300 we had plenty of time to make our way via tube to Earls Court. The hotel is a five minute walk from the tube along easy navigitable streets. Check in was quick. 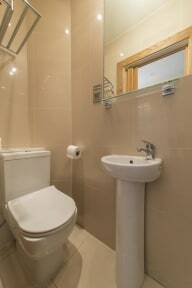 The en suite double room was small and clean, with its own bathroom. The shower was powerful and hot. A door led down an alleyway to the garden which was pleasant. There is WiFi but we couldn’t get it to work. Im sure staff would have helped if we had asked. We went to sleep instead! Make sure you have all your information with you upon check-in, including your email correspondence. Have them available in case there is a discrepancy. Most of the staff is helpful, however, the lady that will check you in during the day is far from a customer service agent. The rooms are cleaned daily. I would recommend bringing your own pillowcase. (I found the hotel cases very rough) Prepare for a workout if you are put in a top floor room.